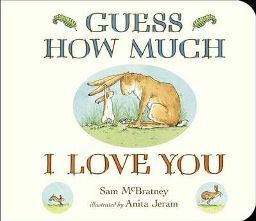 ‘Guess How Much I love You?‘ is a delightful little picture book for young children. It tells the story of Big Nutbrown Hare and Little Nutbrown Hare who both love each other very much. In fact, they love each other SO much that they find it difficult to describe just how much so they enter into a little guessing game with each other!